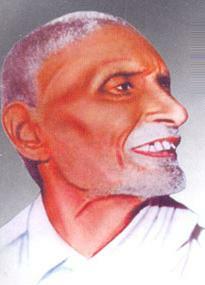 Pingali Venkaiah was born to Hanumantha Raidu and Venkat Ratnamma in Bhatlapenumarru,Krishna district, near Masulipatnam, the present day Machilipatnam of Andhra Pradesh, British India. He belonged to a Telugu Brahmin family. After finishing his primary education at Challapalli and school at the Hindu High School, Masulipatnam(now, Machilipatnam), he went to Colombo to complete his Senior Cambridge. Enthused by patriotic zeal, he enlisted himself for the Boer war at 19. While in Africa he met Gandhi, and their rapport lasted for more than half a century. He was the eldest of 6 brothers and 2 sisters. His grandfather's name is also Venkayya. His younger brothers were Gopalakrishnaiah, Seetharamaiah, Balaramaiah, Achyutharamayya, Sivaramaiah and sisters were Mahalakshmi and Tripuramma. He married Rukminamma, daughter of Turlapati Venkatachalam and Mangamma. They have 2 sons and 1 daughter. The eldest son Pingali Parasuramaiah worked Indian Express as a correspondent. He was also a geologist. He lived in Jandrapet, Chirala Prakasam district with his wife Damayanthi and daughters Annapurna,Nagalakshmi and Bhavani. Pingali only daughter Seethamahalakshmi, widow of Ghantasala Vugra Narasimham is the only direct sibling living now. She bore 3 sons and 3 daughters. 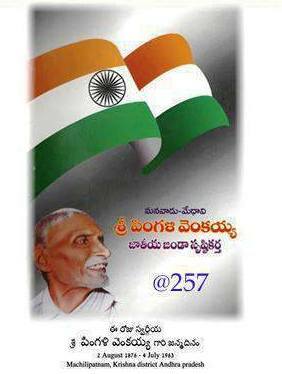 Pingali's son late Chalapathi Rao worked in the Indian army. His wife Janaki bore them 2 children. The eldest son Pingali Dasaratharam was the editor of Encounter, a political fortnightly from Vijayawada. He was murdered on 31-10-1985 in Satyanarayanapuram Vijayawada. His wife Suseela lives in Nandigama with her 2 sons and daughter. Chalapathirao's daughter Girija is living in Vijayawada with her husband Subramanyam.they have 1 daughter and one son.